It’s back on. Kit Kat Chunky have released four more new flavours of bars as a trial, and they are up on Facebook for you to vote for your favourite. The one with the most votes gets to stay on the shelves. Last time I got rather excited about the peanut butter edition, but this year I plan to just work through the varieties with an open mind. On the list we have Coconut, Hazelnut, Mint and Chocolate Fudge. I managed to pick up all four bars in a local newsagent, and I thought I’d start by trying the coconut. Once it was unwrapped the coconut aroma was lovely and strong, and it blended well with the sweet smell of chocolate. Strangely enough there was no specific layer of coconut running through the bar, the flavour is all mixed in with the milk chocolate coating. I was expecting a layer of Bounty style coconut, but on appearances it looked much the same as a plain Kit Kat Chunky. The flavour was rather lovely though. The coconut was creamy and sweet and worked well with the chocolate. It wasn’t too strong or over powering, just well balance and adding a nice balance to the flavours. It tasted almost cooling to eat, and it reminded me how much I like coconut. Why aren’t there more coconut bars on the market? I love the fact that they tried something a bit different for this Kit Kat Chunky, it adds a lovely bit of exotic to the mix. I’m also looking forward to trying out the other three flavours, but I’ll be honest this is going to be hard to beat. While out and about over this festive time I've spotted a few variations on things that I really like and felt compelled to try. The first of these is Fentiman's new CherryTree Cola. As you can see we are in the 'local' of The Junction Harborne which has kept me supplied in the D&B and regular (Curiosity) Cola while my disappointed friends work their way down all the speciality ales. 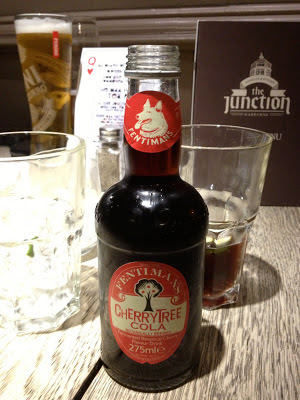 This is indeed very similar to the standard cola in that it tastes like old style cola sweets and has a deep, pleasant taste only this time there are cherry sweets floating on the top. The smell is strong but welcoming, and sips were had by all. It was generally agreed to be a nice drink, but not one that you'd want to be on all night. I think as a sip and chat drink this was spot on, but I couldn't drink two or three of these without being over cherries. I shall pick op the odd 275ml of these and stick to the 750ml varieties of the other ones that I like to glugg in more massive volumes. 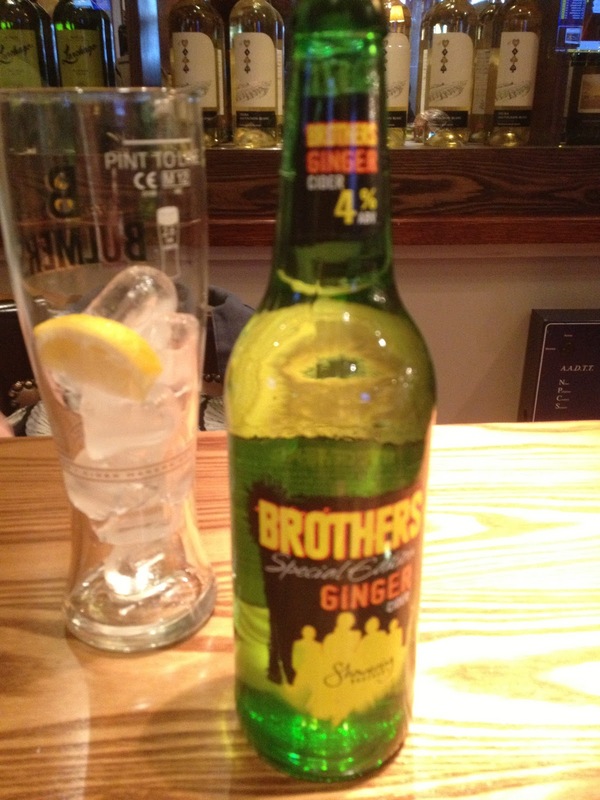 This next one is a variation on my favourite alcoholic drink ever - Brother's Cider. This special edition has no real hint of Christmas to it's packaging either, but does use ginger to give it a bit of a kick. A quick google says that this has been around since March last year in some places, but that people seem to struggle to find it! I must be hanging out in all the wrong places. This was Ms. NLi10's drink as she is much more keen on ginger than I am, but I have to say that this was most pleasant and something I'd buy for myself in the future. 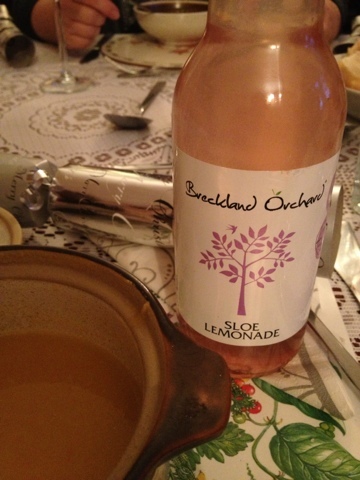 The cider flavour was there and the ginger didn't overpower it but sat alongside to give it a touch of warmth. Cider you can drink on a cold day is definitely a boon. Another hit from the Brothers. There are some chocolates which you associate just with Christmas. For me this includes Toblerone, Terry’s chocolate Orange and Neapolitans. I’m not sure what it is about Neapolitans that I like so much, perhaps it’s their miniature nature? You can kind of feel like a giant eating a whole bar in just one bite… err, that’s just me isn’t it? Anyway I was pleased to receive some of these chocolate over Christmas. There are three varieties within the box, milk, dark and milk with hazelnuts. 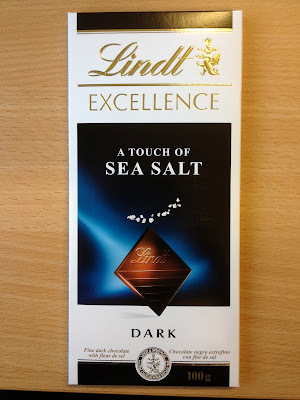 Milk chocolate – (blue wrapper) – This was a surprisingly soft milk chocolate, that was very sweet but easy eating. The chocolate was also rather silky in texture which gave it a nice hint of luxury. Dark chocolate – (red wrapper) – This chocolate was a lot firmer than the milk and would have a decent snap (if you ever wanted to break a small Neapolitan). The flavour was quite strong and very rich. It was less sweet than I was expecting, but brought about a flavoursome treat. Milk chocolate with hazelnuts – (orange wrapper) – The was made with the same soft milk chocolate as the pure bar, but actually managed to pack in a fair amount of nuts, albeit in tiny pieces. It had a lovely hazelnut flavour and a nice bit of texture too. All three chocolates are lovely, I just would have like a little more variety in the flavours. Perhaps a coffee, or an an orange one or a caramel and a white chocolate for example? I’m not sure what other makes are doing Neapolitans this year, but I might have a nosey on Saturday – before they all disappear again for another year. It’s a shame Terry’s don’t make them any more as I always used to get theirs, and I don’t seem to have settled on a substitute yet. There are lots of snack foods that are said to imitate the mighty snowball, so in honour of the UK dreaming of a wet christmas I thought I'd share a few. First up are Tunnock's Tea Cakes - these have been around forever in snack terms and are still the same as I remember as a child - except these are new and have Dark Chocolate! For those who are yet to try these it is a soft biscuit base with a huge marshmallow on top covered in the thinnest coating of chocolate imaginable so that the experience is heightened. Switching the chocolate to dark doesn't make as much difference as originally hoped, but they are still great and even better when put in the fridge so the chocolate goes snap. Well recommended as an interesting spin on a classic. I got these in Asda so they are probably on general sale. 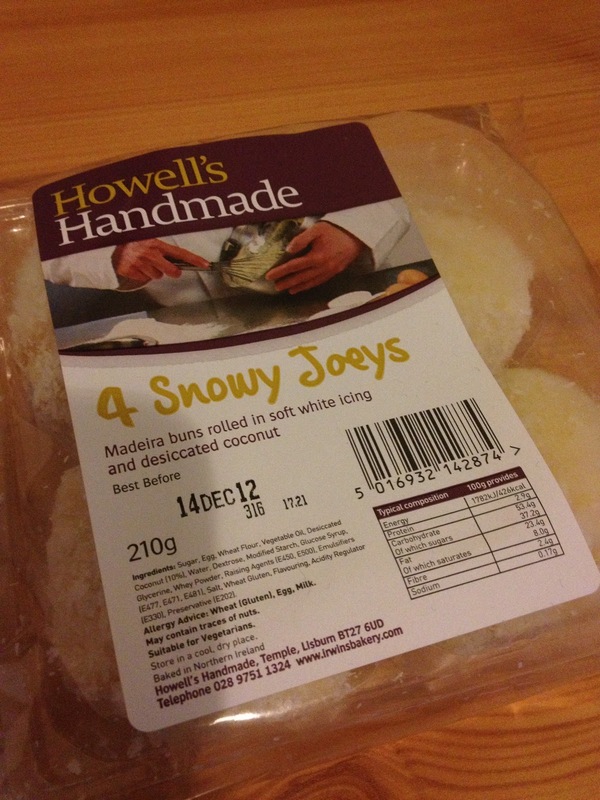 Next up is one my partner spotted at the Good Food Show in Birmingham - Howell's Handmade Snowy Joeys! The main important distinction between these is that the top one being marshmallow means that it's unsuitable for veggies and vegans which makes sharing at home not an option. In this case they are coconut covered madeira buns which means they are quite soft and have a lovely and unexpected texture! As these were from a trade show I'm not sure where stocks them (smart supermarkets will be planning to grab them for next Christmas I think) but they have a website so you can jump the queue if you like. Both lovely snacks for very different reasons. Any other popular snowball treats out there that I've not mentioned? I hope everyone has had a good Christmas and has been enjoying the holidays. One of the Boxing Day traditions is to eat up the turkey leftovers. This usually means turkey sandwiches or a reheated recreation of the original Christmas dinner. If you fancy something a bit different Pataks have brought out this new turkey curry sauce to brighten up any spare turkey. When I looked at the jar I was a little concerned that the sauce might be a little sweet, with its mention of raisins and coconut. I tend to go for a medium spice curry sauce, but this is mild as I guess it is trying to cater for everyone and not introduce too many hot spices after all the previously consumed rich food. Although I’m happy enough with a mild sauce, I was still hoping for lots of flavour and not too much sweetness. We made this sauce up with some spare turkey breast, red peppers and some mushrooms. I have to say it smelt lovely while it was cooking. Once made up it maintained its aroma and was quite a deep orange colour. The taste was actually quite impressive. Although the mentions of raisins had put me off a little, the sauce wasn’t weirdly sweet, in fact it had loads of flavour. There was only the very gentlest hint of any heat, but all the flavoursome spices shone through. It reminded me of a Jalfrezi curry without the chilli and it’s nice to see a mild curry pack in so much taste. While in Cardiff at Chapter Arts Centre to see comedienne Josie Long I spotted a few interesting snacks. Green Chocolate Stegosaurus? Don't mind if I do! Locally made white choc just coloured a bit to get me overexcited and shaped into my favourite of the dinosaurs. Very Nice! 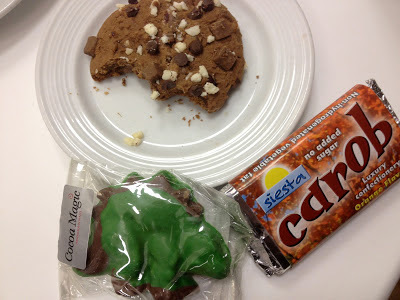 The carob was OK, but the texture is essentially glue after the first few mouthfuls so less enjoyable. The cookie was not for me but the nibble I had was nice enough. What was worth mentioning was the following day they had a food fair - so we braved the Welsh rain and came back. I had a good look round and would say that it was more diverse than our own Good Food Show a few weeks before and more focused to things you'd want to share with others than your own kitchen supplies. While sitting sampling the hot chocolate as we'd arrived too early we also (in a typically bizarre twist) got invited to a screening of a Charity documentary about cataract operations in India (which was a lot more interesting and uplifting than it sounds) by the charity Second Sight so enjoyed that too. Our chosen table looked out over this little corner which had a lovely home made stall on the far side, a stall stacked with loads of amazing looking cupcakes made by Mel (that I didn't try due to the usual practice of having to ration what I could eat or carry home) and one round the corner selling preserves. 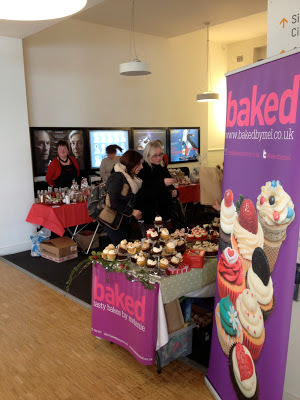 I picked up a little present from the home made stall (which I shan't discuss or photo as it's for Xmas) and gazed restrainedly at all the cup-cakes... 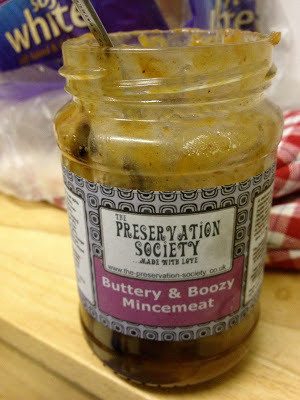 I also looked at the preserves, and my tiny brain hatched a plan. 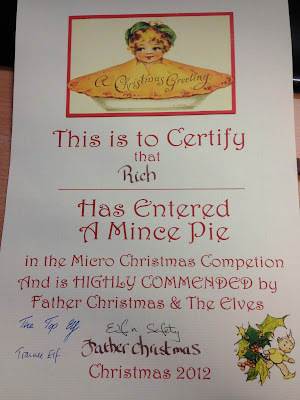 My office/laboratory were holding a Mince Pie Celebration that would result in prizes and glory, but I can't stand mince pies (raisin/sultanas again)! I used to love baking, but had never made mince pies and decided that I could probably make a dried-fruit free version that both qualified for judging and was edible by me. As the deadline approached and I'd not managed to do anything about it I spotted this on the stall. I marked out the tri-force and folded up some oddly misshapen parcels. At this point the lovely smell of the apple and cinnamon was trying to convince me to eat the mixture, but I just couldn't get over the whole shrivelled grape thing and stuck to making some for the judges. Here we have the raw item - wrapped up in their Jus-Roll pastry (yes - I know it's cheating but it's a lot quicker this way - I've made puff pastry from scratch a good few times though). And 10 short minutes later we have a finished product! Two of them really didn't last long as Ms. NLi10 gave them their first review by eating them as pudding and saying they were nice. I also made and baked some chocolate ones, but I'll save that one for another day (I still need to write up the Gran Marnier baking disaster actually)! "Excellent novelty value scoring very highly for innovation. We know that Rich couldn't decide whether to bake these or fry them, and we think that perhaps he should have gone for the fry. Nevertheless, excellent thoughtful mincemeat and a great fusion food idea." 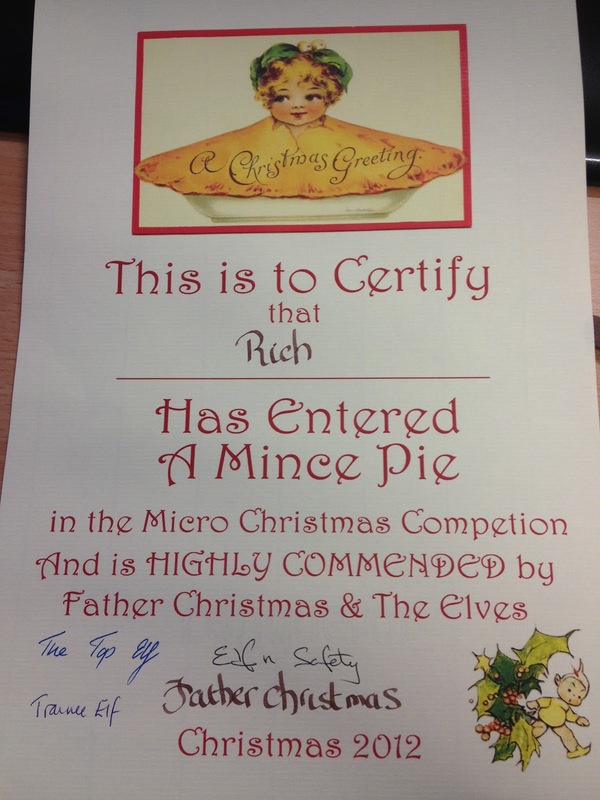 This wasn't quite enough to win or place as runner up (far more experienced bakers received those accolades with pies made entirely from scratch so sweeping the bonus points up there), but it was good enough to get the Highly Commended certificate which is one for the trophy cabinet. I think that The Preservation Society (whose name I love) can be proud of this, it was a universally loved mincemeat and all the secondary judges in the consultant's offices really enjoyed finishing off the batch. So much so that I have to now use the last third of the jar to make a few more for those of us in on Christmas Eve, but may need to resort to more mass produced varieties such as Waitrose for those to take to the Boxing Day family gathering. Merry Christmas readers - I hope that you can find something similar lurking on the local stalls to add a touch of hand-made magic to your Christmas experience. 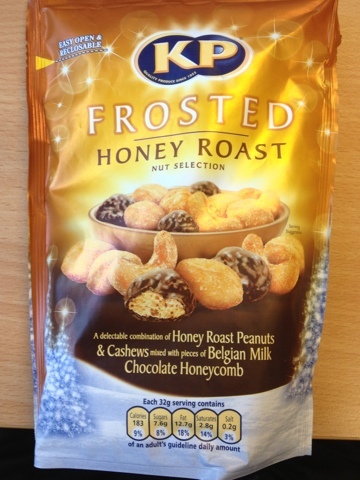 One of the many reasons to love Christmas is the fantastic range of snacks and goodies that appear on the shelves. I have to say the Foodstuff Finds cupboard is looking pretty amazing at the minute and trying to choose a bag of crisps to share is quite a difficult task! Don’t worry we will be writing about all that we try over the Christmas period. We finally decided on tucking into these Baked Ham and Sticky Marmalade Flavour Crisps from the Taste The Difference range at Sainsburys. When we opened up the bag the smell of marmalade was quite strong, and there was a lovely meaty aroma which followed. It was the other way round in taste though, and it was the rich ham taste that took the prime spot. There was just a gentle citrus tang with each crisp that enhance the meaty flavour. These were tasty well balanced crisps. The texture of the crisps was spot on, they were nicely firm, but not sharp and hard as some of the posher crisps can be. I thought these were an excellent flavour choice, and I know our Christmas shopping is never complete without a baked ham in the fridge. They aren’t a novelty flavour though, just tasty crisps that would all year round. John Crabbie and Company of Glasgow was established in 1801. They have always imported ginger from the Far East, which is why they have an elephant trademark. The steeped ginger they use in brewing their ginger beers is matured for eight weeks. For this Spiced Orange Alcoholic Ginger Beer real orange extract was added in the brewing once the maturing stage was complete. At 4% volume this ginger beer was gluten free and served in a 500ml bottle. On opening the bottle there was a spiced ginger aroma and a good strong hit of orange in the smell. The spicy ginger and orange mixed well together in the initial fiery taste. As the flavour progressed, spices rolled around the taste buds tantalising the tongue, there was also sweetness from the orange that complimented the overall taste, leaving a pleasing spiciness for an aftertaste. I found this Spiced Orange Alcoholic Ginger Beer very refreshing with a healthy feeling and warming quality to melt away those winter chills. I reckon this Spiced Orange Alcoholic Ginger Beer would go well with a fishy meal or even better with ginger biscuits or the Benedick’s BitterOranges that Cinabar blogged about last Christmas. Have a Merry Christmas! Here are some more of my holiday pictures of snacks from Switzerland! First up we have some kind of Ovaltine style malt drink that I had while playing cards at KABOOOM in Zurich. 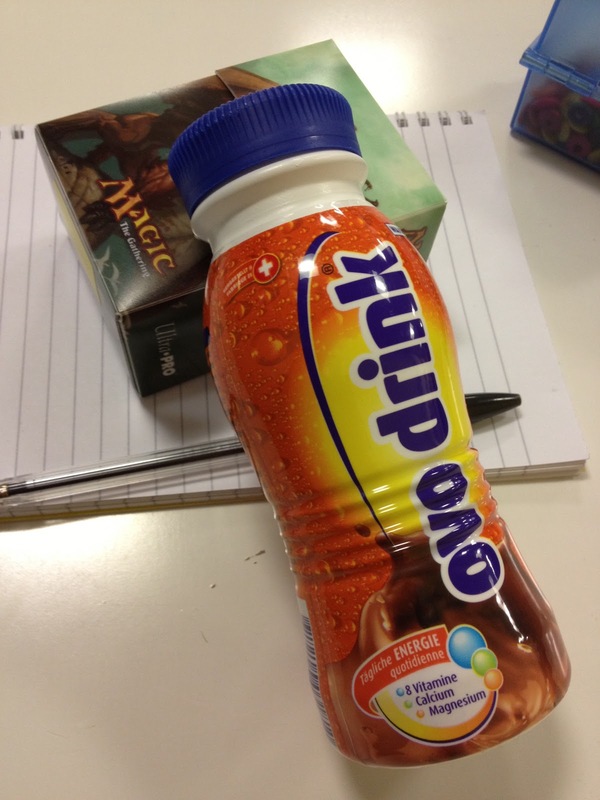 This is drunk cold which is a little odd for me as Ovaltine was always a warm bed-time thing, but it had the taste and the filling nature so was welcome in the snowy evenings. 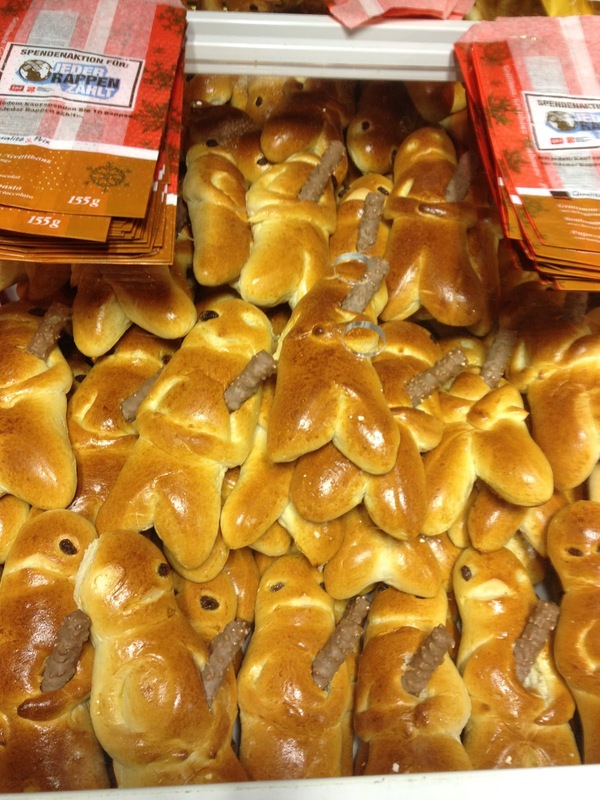 These happy little fellows appear to be a kind of Christmas bread. They had raisin eyes so I only ate a little bit of one. The sticks varied from location to location with some having real twigs and others having chocolate. 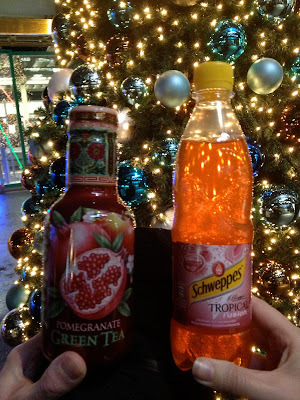 I include this mostly for the pretty christmas tree shot, but the pomegranate green tea was quite nice (and tasted just as you'd expect a mix of the two things would). 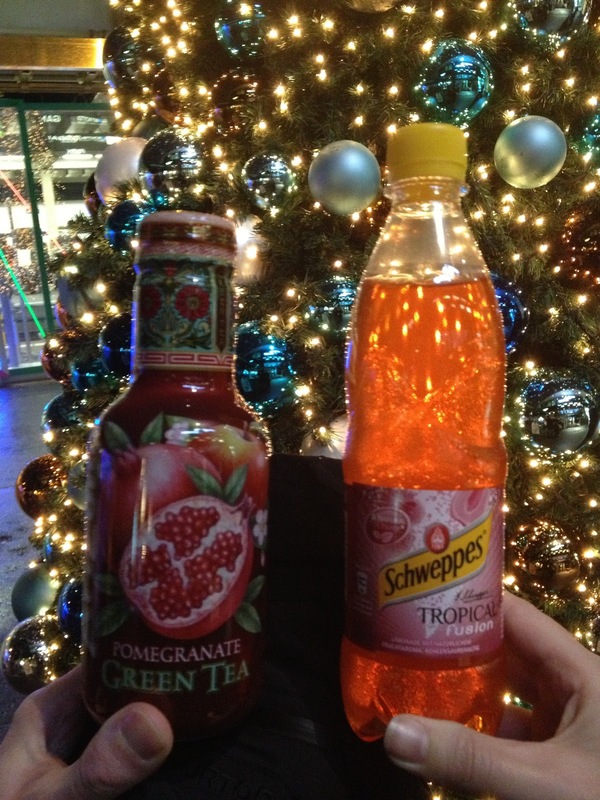 The tropical drink was closer to our blood-orange flavours and also quite nice. Brewed in the Belhaven Brewery, Dunbar, in Scotland, which was established in 1719, this Black Scottish Stout was served in a 500ml bottle and was 4.2% in volume. With almost three centuries of experience the brewery uses pure Scottish water and Scottish triple malts sourced from locally grown barley to brew this stout. It was described as a “smooth, deep, distinctive stout, with a rich roast flavour with hints of chocolate.” On opening the bottle there was a strong aroma of pale malt and a discerning whiff of chocolate malt. My first sip of this stout caused me immediately to exclaim; “Ooh, golly, wow... gosh!” This stout tasted that good! Pale and crystal malts shone through in the initial smooth taste followed by a shear almost angry bitterness and then a succulent chocolate malt aftertaste. I could taste the three hundred years of brewing experience in this dark hearty meaty stout mixed with the feistiness of our friends in the cold hard north. This stout would be perfect for a dark stormy winter’s night with its warming filling qualities and would make a superb after dinner treat or a must have nightcap. This was an excellent stout that should be bought by the cartload, savoured with every sip, and drunk again and again. The idea of combining bacon and maple syrup may sound like a bit strange to us Brits but, over in the States it is a pretty common combination. I have to admit it isn’t something I’ve ever tried, but I couldn’t wait to give these new pretzels a go. The aroma is lovely and smoky when I opened the bag, and I poured some out for sharing. 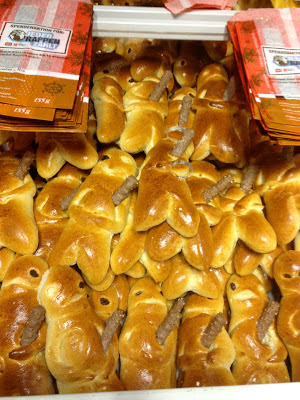 The pretzels are shaped traditionally like knots, and are dusted with plenty of seasoning. I’m not sure if it is just my association of nibbles going well at Christmas time, but they certainly have a Christmassy feel to them. The texture is moreish and crunchy, and I do like the base biscuit/bread tones that come through. 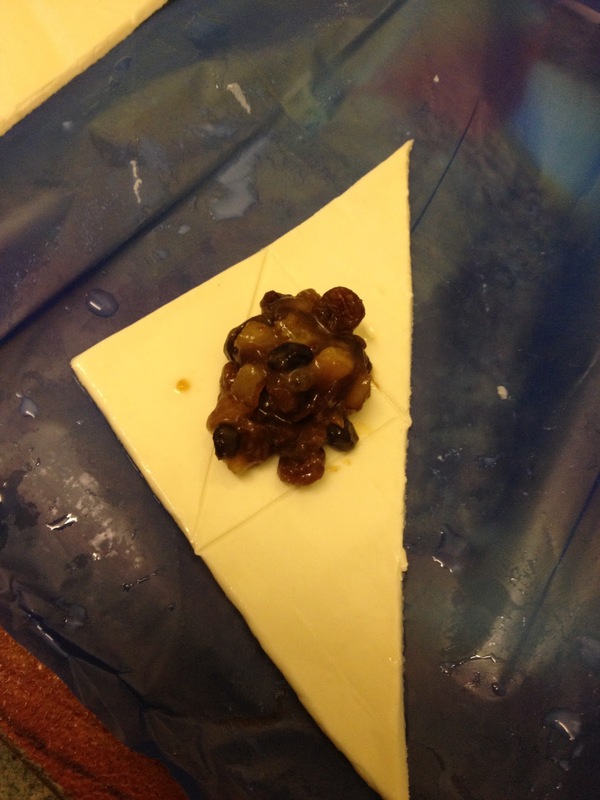 After last year’s successful Christmas cake kit I thought I’d give it another try this year. This time we opted for the Waitrose kit which where the main extra ingredients you needed were eggs, butter and an orange. Obviously they can’t pack the fresh ingredients into the box so this was fair enough. I did notice though if that you also needed to supply your own decorative silver balls which I found a bit odd, surely they could have packed some of these in the kit? I also needed to buy a little icing sugar for sprinkling, but of course they don’t sell small amounts for sprinkling in the shop so I ended up buying a whole tub. When I opened up the box I also spotted that there was no star cutter for the icing shapes, which again was a bit of shame. :-/ Luckily I own a star cutter already, as Sainsbury’s supplied one in their kit last year. I think the benefit of a kit like this is that if you aren’t much of a baker you are simply supplied with just the necessary amount of each ingredient (with the excpetion of the icing sugar). Also the ingredients are pre-weighed, upping your chances of successful baking! I followed the recipe carefully, starting with greasing and lining the tin and doing the prep work. Then I beat the butter and sugar together, I did this by hand and made sure it was nice and fluffy before I finished. As the sugar is so dark the finished mix didn’t go white, but it did turn a lot paler when it was ready. Next came the eggs which you need to add very gradually to stop the mix from separating. Handy tip if you see the mix is splitting add a teaspoon of the flour and it will come back together again (see Miss Horden I did listen in Home Ecc). Then the orange rind gets mixed in at this point and I grated this straight into the bowl and stirred it in. The kitchen smelt lovely and citrusy too. 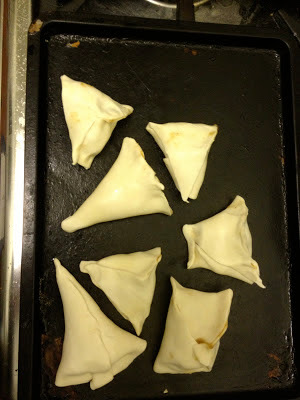 The flour and spice came next and folded in easily (but don’t forget to sift). At this point the aroma from the seasonal spices meant the mix officially smelt of Christmas – result! The fruit and nuts got added next and the mix was really starting to fill the bowl quite impressively and that is about it. We spooned the mix into the cake tin and gently pressed it in to make sure it filled every corner. We covered it with the double layer of grease proof paper (with a hole for air and this paper shouldn’t touch the cake it just rests above it). Then all you have to do is pop it in the oven and wait patiently for quite some time. Once it’s done you can either wrap it up to ice it later or wait for it cool and get straight on with it. I was pleased to see that there was a small pot of apricot jam included in the pack so that we could stick the marzipan on. That rolled out easily on a sugar dusted surface and we chose to cover the whole cake with it. Next up was the icing, this was a little firmer, but again rolled out nicely on the sugar dusted surface. We dampened the marzipan to help the icing to stick. Now I have to be honest, I never bought the silver balls that were suggested on the box, instead I found some pretty decorations in Waitrose and chose to use these. I also had a little icing left so rolled out a few icing stars to, and managed to create a fab looking cake. I have been desperate to try these new Jelly Belly beans since I saw them on some of the American websites. Who wouldn’t want jelly beans coated in dark chocolate? I was rather jealous when I heard about them, so I was super excited to find them at the Jelly Belly stand at the Good Food Show in Birmingham. I did enquire and they confirmed that these are going on sale in the UK and will be available more prominently next year – excellent news! Very Cherry Chocolate – This one reminded me of black forest gateaux, there is lots of chocolate flavours and a strong sweet cherry taste. The dark chocolate is a nice contrast with the sharp sweet cherry. Chocolate Orange – Wow there was lots of citrus tones, and the base jelly bean flavour added a lovely tanginess to the rich chocolate. Chocolate Raspberry – I think the original raspberry jelly bean has a delicate taste. So when you coat that in a strong chocolate the flavour that comes through is even milder. It’s a pleasant bean and the delicate taste of raspberry is there, but it isn’t as strong as the others. Chocolate Coconut – Ever wondered what a Bounty would taste like if you turned it into a jelly bean, well this answers the question! The creamy tones of coconut are enhanced by the chocolate not lost with them, so this one is beautifully balanced. Chocolate Strawberry – This bean had a good strong fruity berry base flavour, which was complemented by the chocolate and the two tones worked together perfectly. The jelly bean equivalent of a chocolate dipped strawberry – yum! I read the preparation instructions on the outside of the bowl and added the soup powder and garnish to the stringy noodles before adding bowling water up to the line in the bowl. I covered over the bowl for four minutes and then added the soup base before stirring. The stringy noodles and three sachets mixed together in the recently boiled water very easily indeed. The noodle soup smelt like lobster, though I couldn’t detect any spiciness with my old nose. After the bright orange liquid had cooled a little more I braved a taste, and was rewarded at first with a fishy lobster flavour followed by a mouth tingling spicy chilli heat. This was a pleasant tasty hot spice, that produced a bead or two of sweat on my brow after a few messy stringy noodle mouthfuls, but wasn’t at all uncomfortable. I dipped in some bread whilst I chewed the noodles and then drank off the rest of the spicy orange liquid. I noticed there was some pepper left over in the bottom of the bowl, but other than that I emptied the bowl and dumped it unceremoniously into the recycling bin. I’ll have to hunt this Spicy Lobster Hot Pot Flavour out again and the Myojo’s Spicy Mushroom Flavour, which I have in the Foodstufffinds’s store cupboard. Although I’m looking for “real” mushrooms in that bowl, no “imitation” ventriloquist beetroot juice gargling turnip mushrooms! 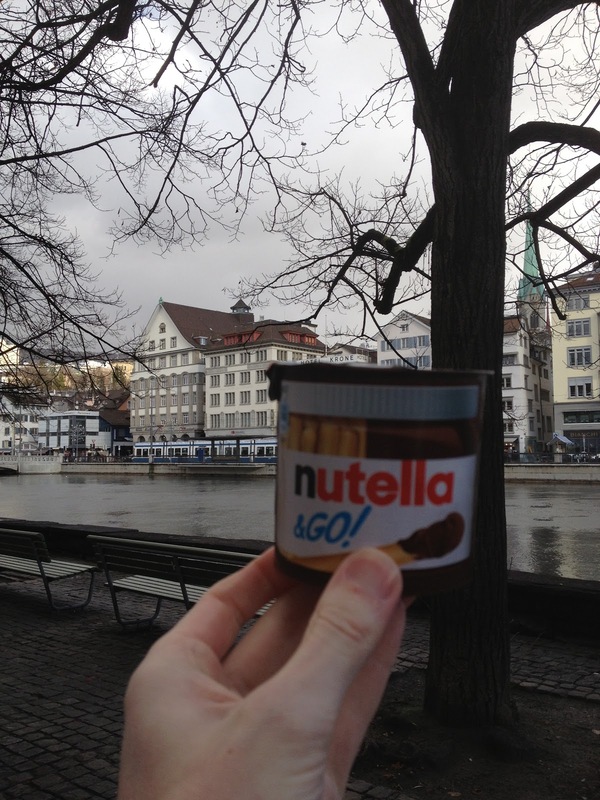 Here are a few things that I picked up while in Zurich last week! Hiding by the checkouts was another dip style product that I'd not seen here since 2008 when Cinabar reviewed them. I guess it must have been a limited launch thing that didn't take off in the UK. It's still nutella and it has nice bread sticks. Looses points for me having to take my gloves off to eat it though!! Back in the warm with Swiss favourites Lindt I saw some of the sea salt chocolate. We have this in the UK too (I picked some more up after returning) and it's a lovely one square at a time dark choc with a twist. It's nowhere near as fancy as the FYI stuff, but it's certainly an appealing winter treat for yourself. The salt gives the flavour a zing to it when you come across the crystals, which I found quite fun. The Tesco Finest range of Handcooked crisps has a bit of a history of bringing out some really interesting seasonal flavours. Last year they brought us the rather excellent Mince Pie flavour crisps, so my expectations were high! As it is winging its way towards Christmas I was pleased to discover that this year we have Christmas Pudding & Brandy Butter crisps! Oh yes, these were made for me! The problem with the idea of sweet sounding crisps is that I couldn’t decide whether or not to have some with a sandwich at lunch time, or to pour some in a bowl for sharing. I went for the latter, but as these aren’t as sweet as I was expecting, I think they would work well with savoury too. Once they are in the bowl you immediately notice just how dark these crisps are. They reminded me in colour of the Guinness crisps we tried a while back, but these are a totally different taste experience. The main flavour that shines through is a Christmas spice and a very burnt caramel taste. It’s such a dark caramel, that it is bordering on being savoury, and as such works well with the background potato flavour. I’m not trying to say there isn’t any sweetness, it’s just that it is subtler than I thought it would be. There is almost a twang of brandy, but again this slight alcoholic taste isn’t far from being like a very mellow vinegar which as we all know works remarkably well when paired with crisps. The aftertaste is a slight hint of salt, which brings down the spices from being sugary to a gentler taste with a hint of savoury. The crisps worked well, despite having sweet tones, they are well balanced and are somewhere between both sweet and savoury. I guess the best way to describe them is the flavours of Christmas pudding and brandy butter but re-mixed and toned down to work as a variety of crisps. Deliciously different. While I was picking up a few bits in M&S these fabulous looking chocolate puddings caught my eye. They really are quite stunning to see, they are made of chocolate mousse, look like individual Christmas puddings and are encased in a neat plastic bubble to protect them. I picked them up to have as a treat after tea, and after I paid for them I put them in my shopping bag to carry home. As M&S is in the town centre this did mean that these got lugged around a few other shops before finally being transported by car home. Despite the fact that one of these must have been nearly sideways in the bag for most of that journey they actually arrived in perfect condition which was pretty impressive. Even more so when I took them out of the fridge to serve and I discovered that these are literally just made of mousse and there was no hard chocolate surface protecting them. The mousse sits very neatly on its own plastic tray, which I think might be the best way to serve them. I thought they would look nice on proper plates but when I realised how delicate and soft they are the black plastic tray that they are already sitting in looked like a much safer idea. They do have a firmer base if you want to negotiate the transfer, but I could see it ending in disaster. The dessert is made up of a thin layer of firm chocolate sponge as a base, a huge serving of silky chocolate mousse, a layer of white chocolate mousse, a pretty holly decoration and, saving the best to last, a luscious caramel filling. From the first mouthful it was clear that the phrase mousse wasn’t doing this dessert justice. Its rich, and has a lovely strong chocolate flavour, with a good hint of sweetness. 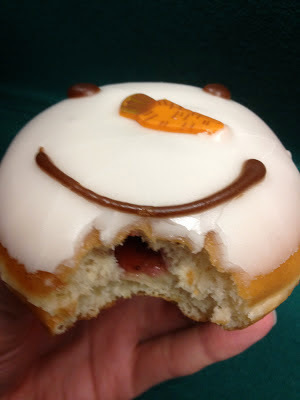 The texture is thick and silky, and not soft and bubbly like I was expecting, it was more of a fondant. The texture gives the dessert substance, and although it is quite filling you appreciate every spoonful. While eating the indulgent chocolate fondant, you hit caramel gold in the middle. There is a thick gloopy serving of rich caramel, that has dark tones and a hint of salt that contrasts nicely with the sweeter flavours. The caramel works so well with the chocolate and really adds tot the overall indulgence perfectly. It breaks up the lovely rich chocolate flavours. In summary this dessert was outstanding. The full flavour of rich chocolate and salty caramel were perfectly matched and every mouthful was heaven. To top that they look stunning too. If you are looking for a chocolaty pudding to treat yourself, or something special for guests who don’t like Christmas pudding then this is perfect. To be honest I’m going to pick up another batch next Saturday just so that there are some in the fridge to look forward to. It’s going to be a major disappointment when then these disappear in the new year. While I was at Cadbury World I spotted something that both excited me and saddened me in equal measure in their big shop. This was the following chocolate bar - Dairy Milk with Oreos (seen below with dog to stop it from sliding down on the chair - the new wrappers seem shinier somehow). This is exciting as I like Cadbury and I like Oreo, but sad as it signifies the mixing of brands from the Kraft family into the beloved local Cadbury chocolate. So far it hasn't been too bad - Kraft have been pretty experimental with their use of the Cadbury crumb and show no signs of shutting down Bournville in favour of cheaper rents elsewhere. Product diversity is good for people like us, but it does feel like a bit of an unholy union. Essentially the bar is white chocolate with Oreos in it surrounded by Dairy Milk. The biscuit bits are more generous than the picture suggests, there are bigger bits in the squares of the choc but those pictures didn't come out very well. Being a fan of both of the sides of this (but actually more likely to buy a pack of Oreos than a bar of Dairy Milk) I am confused by what this is. It seems to have focused on the thin white creme of the Oreo - the dominant flavour and possibly the majority of the chocolate are this. This goes well with the Dairy Milk, possibly overpowering it slightly, but means that the flavour is more like a white chocolate than a normal Dairy Milk. The biscuit is noticable and very crunchy in parts but the flavour is swamped. Don't get me wrong - this is fairly enjoyable, but it feels like a miss. I don't think it'll appeal to biscuit lovers, I don't think it'll appeal to fans of Dairy Milk, and fans of white choc are likely to overlook it due to it's milky exterior. I'll bet they tried all the other logical combinations (hopefully including using Bournville Choc on the outside to match the dark bourbon of the Oreo) but decided that this was the best. As a 'Dairy Milk variety' it works well enough, but I wouldn't expect this to become a renowned product in the range so grab one while they still exist if you fancy a try. Last month I tried Peeps for the first time, and I have to say I loved them! I tried the caramel chicks, but while I was in CyberCandy picking them up I also spotted this gingerbread version of Peeps and snapped them up at the same time. I have been keeping them until it felt a little more Christmassy, and thought that they would be a good start to the weekend. Essentially Peeps are just decorated marshmallows, but they seemed to have mastered the art of cute. These Gingerbread Marshmallow Men even come in a packet that looks like a gingerbread house, how smart is that? It means these would make a lovely gift, if you can bear to give them away? The marshmallow if soft, but has a good stickiness to it and the sugar coating just gives them the lightest of crunches when you bite in. The flavour is sweet but gently spicy. There is a lovely hint of ginger, cinnamon and the classic Christmas spices all shining through and as a self-confessed cinnamon fan I loved these. I’m starting to understand why Peeps are as popular as the are in the States. If you do manage to find these in an import shop, it is worth picking them up. They are ideal served with a big mug of rich hot chocolate to provide that perfect winter evening treat. 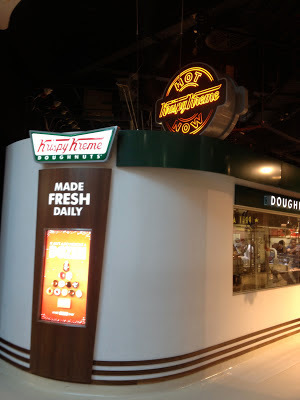 Here in Birmingham we had one of the first Krispy Kreme doughnut manufacturing places in the UK - I think it was maybe 3rd or 4th - in the brand new Bullring. Times have moved on and now you can even pick these up in Tescos! To mark the refit of the shop (which I don't go in often enough to notice) they brought the FoodStuffFinds team some of the new season's selections to try! Here we see the hot light on showing you can get freshly baked doughnuts. Usually there are lots of children's faces pushed up against this window but I went on a quiet Monday afternoon so the glass is nose-print free. It's like a mini Cadbury World for doughnuts. Here we see the standard assorted dozen. I'd love this slightly more if the two original glazed doughnuts were replaced with more exciting things, but only because I have a tendency to buy multiple dozens so have plenty of the vanilla ones. In fact - I only buy Krispy Kremes once a year but buy 6 dozen to share for my Birthday at work. My record is 6 KK in one day - the rest are all given away. Christmas tree - white creme centre and sugar ball topping.